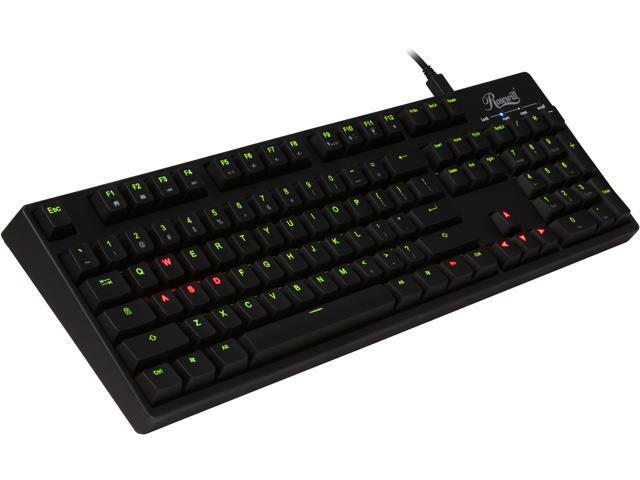 A blend of performance and features, the Rosewill Helios RK-9200 mechanical keyboard lights up your way to a new level of typing experience in everyday use. What highlights the keyboard first is the red/green dual LED backlight with five glowing modes, and independent backlight control for WASD plus four arrow directional keys. The 12-key rollover via USB and Windows key lock/unlock offer you more gaming confidence. You'll also appreciate the FN + F shortcut and media keys, 58" removable braided USB cable, and the gold-plated USB connector for solid contact and durability. 100% Cherry MX Black Mechanical Key Switches Provides an enhanced typing feeling compared with rubber dome keyboards, and an exceptional lifespan of 50 million key stokes. Dual Color Backlighting Every key is fitted with red and green dual LEDs under the keycaps. Selectable color control and five glowing modes (Low/Med/Max/Breathe/Off) offer you customizable eye-catching fun. You can also independently control the WASD and 4 arrow directional keys' backlights for highlighting. 12 Key Rollover The 12 key rollover via USB prevents anti-ghosting, even in the most intense battles. Convenient Shorts Keys The FN + F shortcut and media keys enable quick access to frequently used functions. Lockable Win Key Prevents accidental pressing of the Win button in the heat of the game. Other Thoughts: Picked up this keyboard for my workstation. Keyboard looks and feels well made, and keys are what you'd expect from Cherry MX black switches. Opening it up reveals a PCB with a fair amount of flux residue, a little solder splatter, and a single hand-soldered jumper on the LED circuit. Most people wouldn't see the inside though, so I can't ding them for that. The one thing I would really like to see improved though: retain the LED settings through power cycles or at least provide a software interface to set it on boot. Since the computer that hosts this particular keyboard is on 24/7, it's not a *huge* issue, but I can see having to restore the LED mode after a reboot being tedious after a while. Pros: I bought this for my friend who is really hard typer - he really beats his keyboards - so brown switches were the right choice for him. He's really happy with it so far. Pros: - MX Cherry Black switches are great for games, and not too bad to type on as well once you get used to them. - Adjustible back lighting on keys (red & green) allow for different looks. You can have the entire keyboard red or green, as well as individually customize the WASD and arrow keys to either red or green. - Very sturdy and durable. Cons: - The keyboard does not save your backlight settings. The default mode after you power on your machine is standard; as in none of the LED settings are turned on. Minor annoyance, you just have to change the setting every time, which really only takes a few to several keystrokes. - No key cap remover or USD ports on board. Ya think that a keyboard at this price would come with either one or the other. Other Thoughts: Overall very solid keyboard. Also, Newegg rocks for being able to deliver this 18 hours after I ordered it! !